SAN DIEGO -- A notable carry-over from last year's BIO conference in Boston is a vigorous discussion about stem cell research leadership. In 2007, it was Massachusetts Gov. Deval Patrick who announced the creation of a $1-billion stem cell initiative. This year, Maryland Gov. Martin O'Malley unveiled his plan to invest $1.1-billion in that state's bioscience industry, with a strong emphasis on the growth of what he called the nation-leading Maryland Stem Cell Research Fund. California Gov. Arnold Schwarzenegger in this year's conference keynote address touted his state's $3-billion stem cell program, created through passage of Proposition 71 in 2004. Gov. 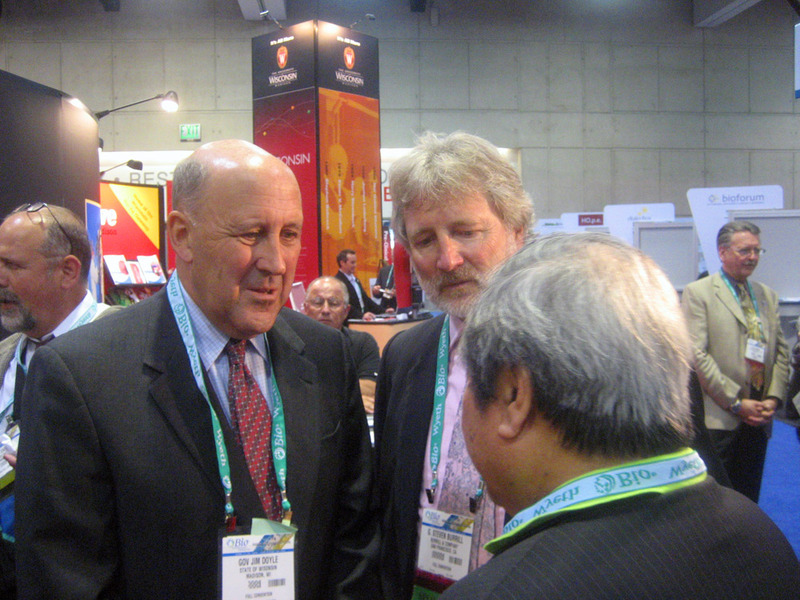 Jim Doyle throughout BIO 2008 has hailed Wisconsin's selection as host for the World Stem Cell Summit in September and taken advantage of the platform BIO provides to reinforce the state's international leadership in stem cell research. One of the most striking takeaways from this year's conference, though, is the remarkable breadth and depth of Wisconsin's bioscience industry. Everyone in the Wisconsin contingent is rightfully proud of the state's preeminence in stem cell research. As we continue to compete against the likes of California and prepare for the summit in Madison this fall, it is also important to remind ourselves of the broader industry in which Wisconsin's stem cell efforts occur. A terrific example of our industry's breadth was on display yesterday at Wisconsin's BIO Theater. Dr. Juliette Schick, co-founder and chief executive of Madison's SciLog Inc., a developer and marketer of novel liquid-handling equipment, announced that her company recently signed a worldwide licensing agreement with global giant and hometown hero GE Healthcare. The agreement gives GE Healthcare worldwide rights to make and sell automated single-use systems based on SciLog's technology for use in biopharmaceutical production. The technology's cost-effectiveness, performance and scalability could revolutionize the production of biotechnology products around the world. Further proof of the breadth and depth of the industry in Wisconsin can be found in a Battelle study of state bioscience initiatives, employment and growth trends during 2001 to 2006. The study was released jointly Wednesday by BIO and Battelle, the world's largest non-profit independent research and development organization. Madison, Wis., the report said, is the only U.S. metropolitan area in 2006 with a specialized job concentration in all of the four sub-sectors of the biosciences -- agricultural feedstock and chemicals, drugs and pharmaceuticals, medical devices and equipment, and research, testing and medical laboratories. "In the previous version of this report using 2004 data, Madison also achieved this distinction in broad by deep industry concentration," the report said. It is a distinction we should always keep in mind. -- Leonhart is executive director of the Wisconsin Biotechnology and Medical Device Association. Massachusetts, which just passed a $1-billion life sciences bill to invest in high-tech infrastructure and research and development over the next 10 years, is in the best position of any state to achieve high-quality economic growth thanks to its vast array of technology and science assets, a new Milken Institute study shows. Massachusetts ranks first in the Milken Institute's 2008 State Technology and Science Index, followed by Maryland, Colorado and California. Wisconsin was in 22nd place. According to the report, regional competition for technology industries has increased since the last release of the Index in 2004. Not only are states vying with each other for human capital and resources, but countries like China and India are increasing the competition on a global level. Wisconsin's BIO Theater opened today with a number of fascinating presentations by some of the state's bioscience leaders. Two of the presentations -- one by InViragen and the other by FluGen -- spotlighted Wisconsin's leadership in infectious disease prevention and treatment. These two exciting companies are at the heart of an emerging infectious disease cluster in the Madison area. InViragen, headquartered in Fort Collins, Colo., announced earlier this year that will expand its presence in Madison with a 4,000-square-foot laboratory and office. The lab will be used for research and pre-clinical testing of the company's life-saving vaccines to protect against dangerous emerging diseases like the avian flu, dengue fever and the West Nile virus. InViragen's Wisconsin expansion will create up to 10 new positions. During the company's presentation at the BIO Theater, Chief Executive Dan Stinchcomb highlighted InViragen's commitment to international collaboration. InViragen's work with partners around the world serves as an outstanding small-company model for attacking public health issues of global importance. InViragen's presentation was followed by FluGen and its founder, president and chief executive, Paul Radspinner. After service at Deltanoid, WARF and Eli Lilly, Paul is leading efforts to commercialize technologies created by Dr. Yoshihiro Kawaoka, a UW-Madison professor and one of the world's leading influenza experts, and Gabrielle Neumann, a virologist at UW-Madison. The company will collaborate with the new UW-Madison Influenza Research Institute, which is being led by Dr. Kawaoka. Radspinner described his company's efforts to develop better influenza vaccines and create new influenza treatments. FluGen's unique, industry-leading efforts are aimed at both seasonal and pandemic influenza around the world. The work of InViragen and FluGen, when coupled with the infectious disease diagnostics being developed and marketed by Third Wave, EraGen, Prodesse and others, has created a substantial infectious disease footprint in the state that covers the entire spectrum of the discipline. Wisconsin's leadership in infectious disease prevention, detection and treatment received the spotlight at today's BIO Theater. The state's position as a world leader in infectious disease can only grow from here. SAN DIEGO -- Private dollars invested in Wisconsin start-up companies operating in high-growth sectors such as biotechnology grew substantially in 2007, according to a report released Wednesday. A survey conducted by NorthStar Economics and the Wisconsin Angel Network showed $146.9 million in early-stage investments in 2007, up from $102.9 million in 2006. That's a 43 percent increase in dollars invested by individual angel investors, angel networks, early-stage funds and others interested in Wisconsin start-up deals. Venture capital investments in Wisconsin -- those later-stage investments made after early-stage companies begin to grow -- also increased in 2007 to $90 million from $73 million in 2006, the survey showed. In addition to the early-stage and venture capital investments, Wisconsin also showed year-over-year gains in Initial Public Offerings (four offerings raised $343 million) and federal Small Business Innovation Research grants ($33.7 million). Gov. Jim Doyle announced the survey results during the 2008 BIO international convention in San Diego, Calif., which is being attended by a Wisconsin delegation that includes representatives of many early-stage companies. Doyle spoke during the Wisconsin reception hosted by Quarles & Brady LLP. Doyle and the Wisconsin Legislature have worked together on initiatives to spur creation of so-called ''risk capital'' in Wisconsin, including investor tax credits and the formation of the Wisconsin Angel Network to help facilitate deal flow, investor exchanges and network creation. Angel investors are high net-worth individuals who invest in start-up ventures, sometimes alone and sometimes as members of a group. More than 250 angels in 20 groups are affiliated with WAN, which is a public-private program of the Wisconsin Technology Council. Surveyed for the report were Wisconsin angel groups and funds, as well as eight major law firms that handle deals for individual angels and others. Other sources of data included state tax credit data, national venture capital reports and Tech Council data on SBIR grants. ''Wisconsin's early-stage capital market is growing at a rate that exceeds the U.S. average, which speaks to the tremendous strides being made by Wisconsin start-ups and those who help those companies grow,'' said Mark Bugher, chairman of the Tech Council and director of University Research Park in Madison. Visit http://www.wisconsintechnologycouncil.com/uploads/2008WRCR.pdf to download a copy of the 17-page report, which includes additional figures on investments as well as a guide on how the risk capital markets work in Wisconsin and beyond. SAN DIEGO -- John Morgridge, chairman of the board of Cisco Systems, and his wife Tashia, wanted to do something that put UW-Madison -- and Wisconsin -- "on the map'' of world scientific research. That's exactly what they did. Their $50 million gift has now morphed into the new $150 Wisconsin Institutes for Discovery, an architectually unique scientific research center designed exclusively to bring scientists together to collaborate on research, a Wisconsin Institutes for Discovery leader said Wednesday at BIO 2008. "This is easily the most exciting thing to happen to the university in a generation,'' said Laura Heisler of the Wisconsin Alumni Research Foundation, who spoke to a crowd at the Wisconsin pavilion on the convention floor. What is most interesting, she said, is that the entire project is based on collaboration. When competed, the Institutes will have research capacity for 250 to 300 scientists, who will be working collaboratively to solve complex problems relating to human biology and regenerative medicine. But what will be immediately compelling to visitors to the new Institutes is that the building itself is one of the keys to that collaboration. The first floor will be open, with a restaurant, coffee shop, gardens and flexible meeting space. The three floors above it will be research space for scientists working for the private Morgridge Institute for Research on one side -- and a public research institute on the other. But even the research space is wide open, she said, with scientists having a clear view of the rest of their floor. "If we need to put walls up for privacy, we can do that,'' Heisler said. But the idea is a floor plan that allows maximum contact and collaboration with fellow scientists. It may be controversial when people see how the building is laid out, Heisler said. But she added that the Morgridge family granted money to "put us on the map'' of scientific research -- and this building "breaks down barriers between researchers'' to help do that. The first phase of the Wisconsin Institutes for Discovery is slated to open in the fall of 2010. SAN DIEGO -- The Wisconsin pavilion at the 2008 BIO international convention opened with a burst of activity Wednesday as presentations began in the Wisconsin BioTheater, a small amphitheater built into the 80-foot-long pavilion. Presenters in the morning were EraGen Biosciences Inc. (Miguel Blanc, vice president of corporate development); Planet LLC (Thomas Crabb, president); and Wisconsin Alumni Research Foundation (Laura Heisler, program developer of the Morgridge Institute for Research at The Wisconsin Institutes for Discovery). Wisconsin's pavilion is located in a good neighborhood, by convention floor standards. Pennsylvania, Italy, North Carolina, Georgia and special exhibits on therapeutic drug discoveries are within a stone's throw. Most popular giveaway items in the Wisconsin exhibit? Bucky Badger lapel pins and chocolate chip cookies. Wisconsin Pavilion visitor sports Bucky Badger lapel pin at BIO 2008. SAN DIEGO -- About 40 members of Wisconsin's delegation to the 2008 BIO international convention joined their counterparts from the German state of Hessen Wednesday morning on a breakfast cruise of San Diego Harbor, which is home to a giant U.S. Navy base as well as commercial shipping ports. The cruise, sponsored by Wisconsin's sister state of Hessen, has become an annual networking event at BIO for members of both delegations. Frankfurt is located in Hessen, as well as some of Germany's largest pharmaceutical and biotechnology companies. Martin Herkstroter, chief executive officer of HA Hessen Agentur GmbH, spoke to the Wisconsin crowd. The Wisconsin delegation was led by Commerce Secretary Jack Fischer. "Wisconsin's position in the global economy and our long-term relationship with Hessen make these kinds of exchanges extremely valuable," Fischer said. SAN DIEGO -- On a day when the governor of Maryland proposed a $1.1 billion biotechnology initiative and the governor of Massachusetts signed a similar $1 billion bill into law, Wisconsin Gov. Jim Doyle said there's plenty of room for major research states to work collaboratively on breakthroughs involving stem cells. "This is not a case of one state is going to win and another state is going to lose, or that one state is going to beat all the other states," Doyle said during a news conference at the BIO international convention in San Diego. Rather, Doyle explained, the collaborative and often interdiscilpinary nature of research means scientists from across the country and around the world are often working on common problems, and advances in one laboratory may help propel breakthroughs elsewhere. Doyle said Wisconsin's investment in the biosciences is "on a par" with what's happening in other leading states, especially when it comes to providing the basic tools researchers need. He referenced the $150-million first phase of the Wisconsin Institutes for Discovery and other UW-Madison initiatives such as a new interdisciplinary research center tied to the UW Medical School. "It's on the same scale with Massachusetts and California -- only we didn't need a referendum to get it done," Doyle said. Doyle spoke during a news conference also attended by Bernie Siegel, director of the Genetics Policy Institute and the founder of the World Stem Cell Summit. This year's summit will be held in Madison Sept. 22-23 and will feature some of the world's leading researchers, including Wisconsin's Dr. James Thomson. "I was cold when I visited (Madison last winter), but what I saw burning brightly was your research community," Siegel said. The conference is expected to attract up to 1,000 stem-cell experts from across the world to Madison, which is also home to the WiCell Institute and the National Stem Cell Bank. Danny Heumann, a member of the Genetics Policy Institute board of directors, praised Wisconsin for taking the lead in stem-cell research. Heumann was partially disabled in an automobile accident 23 years ago, and has become an advocate for stem-cell research that may lead to therapies for spinal cord injuries and other traumatic injuries. Doyle also predicted that Sen. Barack Obama, the presumptive Democratic nominee, will lift President Bush's August 2001 ban on federal funding for human embryonic stem cell lines not produced before that date. "I see no reason why Barack Obama should abide by restrictions (on use of stem-cell lines) that are tied to an artificial date when President Bush wanted to make a speech," Doyle said. Doyle did not speculate on what Sen. John McCain, the presumptive Republican nominee, might do about federal funding for stem-cell research. However, some of McCain's votes and statements indicate he would also loosen current restrictions. Bernie Siegel, founder and executive director of the Genetics Policy Institute, speaks at the 2008 BIO International Convention as Wisconsin Governor Jim Doyle looks on. The ribbon has yet to be cut at the Wisconsin pavilion (a brief ceremony will officially open the pavilion at 3 p.m. local time Tuesday), but already leaders of the state's bioscience industry have had two productive partnering meetings. The first meeting was hosted yesterday by Pfizer and included Gov. Jim Doyle, Commerce Secretary Jack Fischer, and other public and private sector leaders. It was a fascinating meeting, during which Pfizer reaffirmed its commitment to partnering with companies in Wisconsin. Pfizer executives told us that there is a new paradigm in today's pharma world. They said their research and development focus has become much more externally focused, with less emphasis on internal R&D and more importance being placed on collaborations and partnerships. I was struck by their commitment to finding the great ideas that are being developed by small companies, in Wisconsin and elsewhere. They know that they must become more active and engaged in state bioscience industries as a means to finding those great ideas. I was very pleased with our meeting with Pfizer. It was a terrific follow-up to the partnering meetings the company held with our help in Madison in mid-December. The meeting also was a great prelude to the WBMA's annual conference in October, which will facilitate meetings between our member companies and large pharma, biotech and medical device companies like Pfizer. We also had a very productive meeting with officials from the provincial government of Manitoba, Canada. Our new friends from the north had sought out leaders of Wisconsin's bioscience industry because they have seen the news of Wisconsin's many tech transfer and commercialization successes. They are interested in learning more about our unique tech transfer system that includes WARF, University Research Park and other important players. The Manitoban officials also are very impressed by Wisconsin's emphasis on creating good-paying jobs through both public and private research. A follow-up meeting in Madison is planned for later this year. Thrive, the economic development enterprise for the eight-county Madison region, has partnered with the cities of Middleton, Madison and Fitchburg to host a display in the Wisconsin Pavilion at the BIO International Convention. This year, Thrive, Fitchburg, Madison and Middleton join 55 businesses and organizations in the pavilion to showcase the bioscience industry in the Madison region. Wisconsin's 378 biotech firms contribute over $8 billion to the state's economy and account for more than 30,000 jobs in Wisconsin, with over 150 companies in the Madison region alone. MADISON -- A state that has experienced historic floods and the announcement of a major plant closing within the past two weeks could use some good news. Perhaps it's found in the steady growth of Wisconsin's biotechnology industry. -- Madison-based TomoTherapy Inc. opened trading on the Nasdaq National Market with an initial public offering of shares that generated $185 million in net proceeds. -- Swiss pharmaceutical giant Roche acquired NimbleGen, a Madison-based firm, for $272.5 million. NimbleGen's employees appear to be staying put in Wisconsin. -- The U.S. Department of Energy announced it would locate a $135-million federal laboratory on the University of Wisconsin campus to study cellulosic ethanol and other biofuels. It is one of only three such DOE labs in the nation, and Wisconsin's first new federal lab in generations. -- The Wisconsin Alumni Research Foundation began to fend off legal challenges to its key patents for human embryonic stem cell breakthroughs. WARF's initial success cooled initial fears in some quarters that its patents would be overturned. -- Construction of Wisconsin Institutes for Discovery began at UW-Madison. This $150-million interdisciplinary research center will be the first of its kind in the Midwest, and a draw for researchers worldwide. -- Organizers of the World Stem Cell Summit announced they would hold their 2008 meeting in Madison, a sign of Wisconsin's prominence in stem-cell research. The latest announcement came a week ago: Hologic Inc., a Massachusetts medical technologies firm that specializes in products for women's health, agreed to buy Madison-based Third Wave Technologies for $580 million. Hologic plans to keep Third Wave's manufacturing and R&D operations in Madison, where the company has 143 full-time employees. -- GE Healthcare has about 7,000 employees in Wisconsin. A five-year master agreement between GE and the University of Wisconsin yielded about 50 project statements; a second five-year agreement for research and intellectual property is under way. -- Sigma-Aldrich has plants in three locations for production of more than 3,500 organic compounds, pharmaceutical products, vaccines, sera and more. -- Genzyme Corp. acquired a Madison-area company in 2005 and maintains a research facility there. -- EMD BioScience and EMD Crop BioSciences operate major facilities in Madison and Milwaukee, respectively. -- Monsanto has six facilities in Wisconsin, including a 100,000-square-foot research facility (formerly Agracetus) near Madison. -- Covance employs about 1,900 people in Madison, where its campus serves 25 pharma and biotech companies worldwide. -- Representatives of Pfizer met with about 20 Wisconsin companies in late 2007. Conversations with selected companies are continuing as Pfizer explores for new technologies. -- Abbott Labs has purchased more than 400 acres of land in southeast Wisconsin, within about 45 minutes of an existing facility in northern Illinois. While there will be 48 states and even more nations in San Diego, all claiming to be biotech hubs, a relative few have what it takes to succeed in one of the global economy’s most competitive arenas. Wisconsin is among that group. Only a few years ago, the big boys and girls of the life sciences world could afford to look past Wisconsin as just another flyover state. Today, they're spotting ample opportunities on the ground. When bad news strikes, it's usually immediate and dramatic. Good news sometimes takes its sweet time to accumulate. That's the case with Wisconsin's biotech industry. The Wisconsin "BioTheater" returns this year with a line up of 16 presenters representing some of Wisconsin's top biotech companies and organizations. Company presentations will take place over the course of two days, with a pavilion appearance by Governor Doyle and special guest Steven Burrill. Presentations are scheduled as followed. Check back to the Wisconsin BIOBlog as we cover these and other presentations throughout the conference. 3:00 p.m. Marshfield Clinic Applied Sciences, Catherine A. 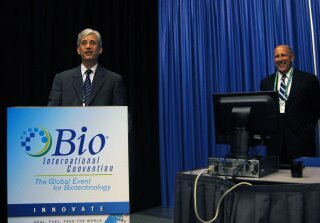 The BIO International Convention is the global event for biotechnology. The event supports the world's largest biotechnology organization, the Biotechnology Industry Organization. This year the conference returns home to its organizer's headquarters in San Diego, June 17-20. 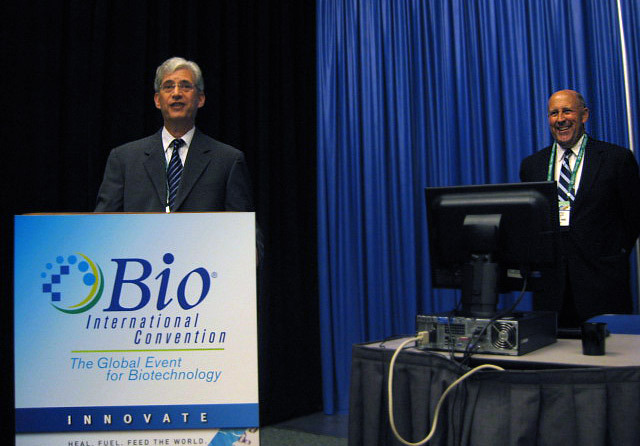 Seven years has passed since the BIO Convention was held in San Diego. Since then, the event's size, attendance and many other aspects have grown tremendously. This comparison exemplifies the event's growth since 2001. Follow the activities of Wisconsin's delegation at the 2008 BIO convention in San Diego by reading the "Wisconsin BIO Blog" beginning Monday, June 16. The June 17-20 BIO meeting will attract more than 20,000 people from around the world. Offered through WisBusiness.com, the blog will include news stories, columns, interviews and video coverage related to Wisconsin's role in the annual convention. Some 120 people from Wisconsin are expected to attend. The blog will also include background information from the Wisconsin Technology Council on the state's growing biotech and medical devices industries. Go to http://www.wisconsintechnologycouncil.com/ or http://blogs.wisbusiness.com/bio/ to read about what's happening on the convention floor. The blog will also include video interviews of a few presenters participating in Wisconsin's "BioTheater," which is part of the Wisconsin Pavilion at the San Diego Convention Center. This year's Wisconsin BioTheater presenters include EraGen Biosciences Inc.; Planet LLC; Wisconsin Alumni Research Foundation; InViragen Inc.; FluGen Inc.; Marshfield Clinic Applied Sciences; CDI Bioscience; SciLog Inc.; Invivosciences LLC; Covance Inc.; NeoClone; High Throughput Genomics Inc.; Centrose LLC; and WiCell Research Institute. Also, look for video of Gov. Jim Doyle's appearance with life sciences investor Steve Burrill. Contributors to the blog will be Tom Still and Ryann Petit-Frere of the Tech Council and Michael Flaherty of Flaherty and Associates, a Madison-based public relations firm. The Tech Council is the independent, non-profit and non-partisan science and tech policy advisers to the governor and the Legislature.